It’s important to test all your code. Code coverage is frequently used as a measuring stick for a developer’s success in creating quality tests. The basic rule of thumb is comprehensive tests should execute every line of code. Coverage, a tool that measures code coverage for Python code, will be used to check what percentage of the tutorial code is being tested. Let’s take a look at the coverage report. On the left, the report shows the name of the file being tested. Stmts, or code statements, indicate the number of lines of code that could be tested. Miss, or Missed lines, indicates the number of lines that are not executed by the unit tests. Cover, or Coverage, is the percentage of code covered by the current tests (equivalent to (Stmts - Miss)/Stmts). For example, myblog/views has 6 code statements that can be tested. We see that our tests did not miss testing any statements for a Code Coverage of 100%. Note that code coverage can only indicate that you’ve forgotten tests; it will not tell you whether your tests are good. Don’t use good code coverage as an excuse to write lower quality tests. Our current command-line coverage reports are useful, but they aren’t very detailed. Fortunately coverage includes a feature for generating HTML coverage reports that visually demonstrate coverage by coloring our code based on the results. This command will create a htmlcov directory containing our test coverage. The index.html is the overview file which links to the other files. Let’s open up our htmlcov/index.html in our web browser. So far we’ve been testing statement coverage to ensure we execute every line of code during our tests. We can do better by ensuring every code branch is taken. The coverage documentation contains a good description of branch coverage. Notice the new Branch and BrMiss columns and note that we are missing a branch in our manage.py file. We’ll take a look at that later. Coverage allows us to specify a configuration file (.coveragerc files) to specify default coverage attributes. The documentation explains how .coveragerc work. We’re missing the False case for that if statement in our manage.py file. 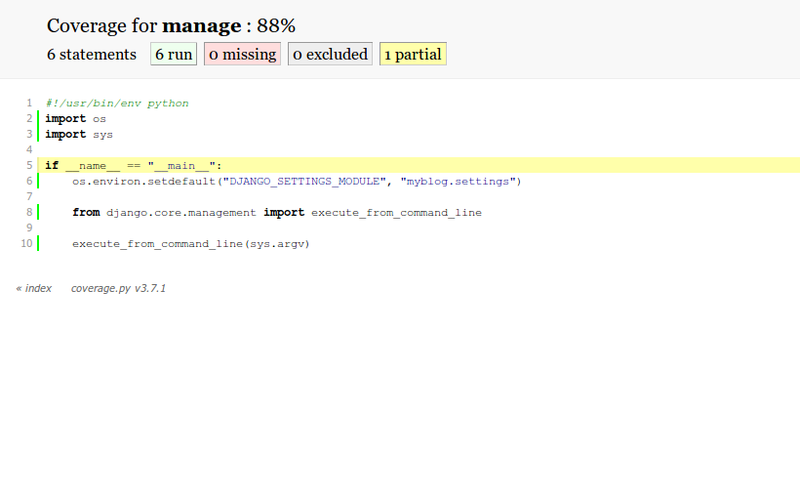 We always run manage.py from the command line so that code is always executed. 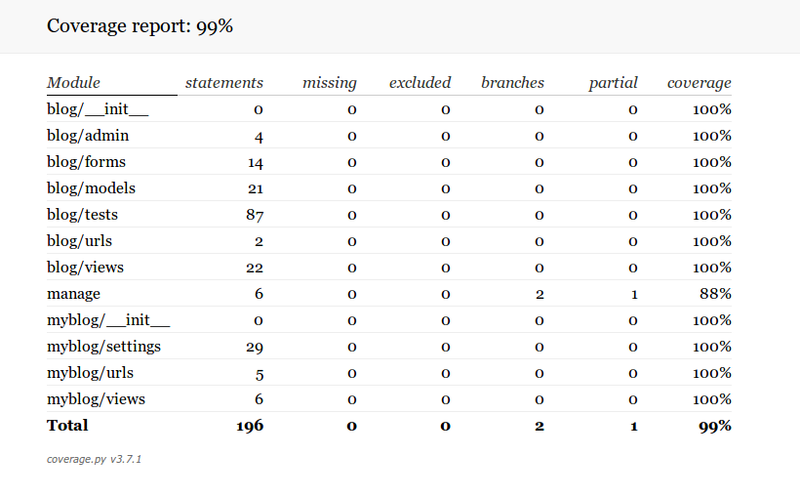 We don’t intend to ever test that missing branch, so let’s ignore the issue and accept our imperfect coverage statistics. For extra credit, figure out how we can exclude that if __name__ == "__main__": line from our coverage count. Check out the .coveragerc documentation for help.